Our Guest Speaker Peter Crozier with Di Hutchings, wife Gail and Tim Hutchings. Being one of our own Peter or Croz needed no introduction and he launched straight into his talk on Antarctica. 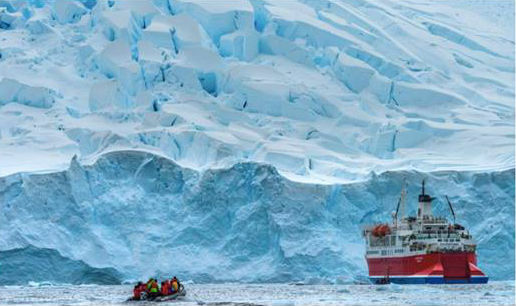 Two trips a day onto the Peninsula and the mainland of Antarctica. None of the cruise ships go into the Antarctic Circle. Before you go onto the Antarctic land, you must disinfect your boots which are issued by the crew. Each time that you return to the ship, you must scrub your boots and wash them in disinfectant and have them checked by the crew for cleanliness. On our first landing, we were welcomed by a lone Adelie penguin. But there were a few more. 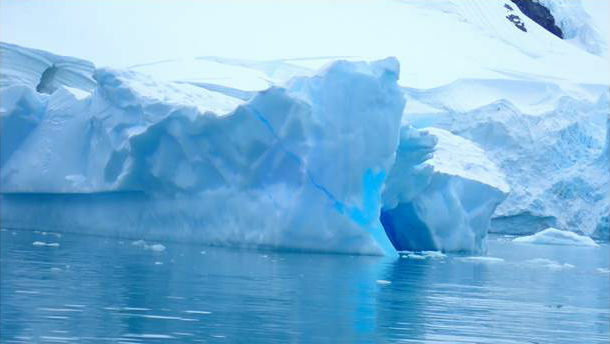 The water settled down as we passed between islands and alongside icebergs which have fabulous blue colours. The strips are caused by oxygen trapped in the berg. This just gives you an idea of a small berg. The iceberg that broke off the Weddel Sea on the east side of the Peninsula about seven years ago was 200 kms long. There is one active volcano on the Antarctic mainland (mount Erebus) and we got the chance to walk up to the top of the cinder cone of the active volcano at Deception island entering through Neptune’s Bellows into the caldera. Everyone was given the chance of diving into the 1 degree water. I must have been underwater when this shot was taken! There are many stations on the Peninsula occupied by Russia, Chile, Germany, India and Argentina. 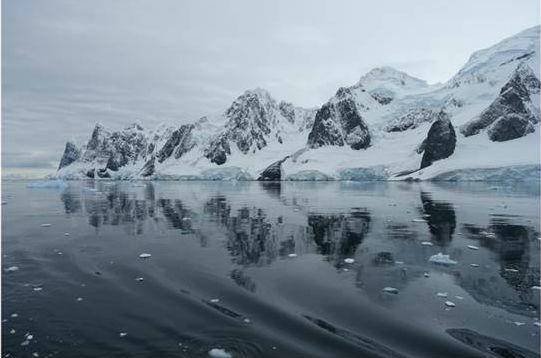 Although there are certain areas of the Antarctic claimed by seven countries, there are about 30countries who have signed the Antarctic Treaty. There are 45 year round stations . the Treaty states that Antarctica is dedicated to peace and research only. There are no national borders and any country can utilise any part of Antarctica they wish. All up, the population in summertime is about 4000 and there are about 20 airstrips. The station that we went to is Brown Station built by Argentina ( and the inhabitants of the penguin colony). Note the white lines of guano from the penguins so don’t stand behind them. You will notice the quite extensive rocky areas around the coast line due in part to the ice melt currently occurring. In winter, the size of Antarctica and surrounding sea ice doubles from that in summer. There are lichens and mosses that exist on the rock in some parts. Yes, there are seals particularly leopard seals and crab eater that love dining on the baby penguins when they take their first plunge into the ocean.. the sea was quite serene and calm most of the time giving ideal periods of reflection. The penguins are very friendly as is one of the staff. 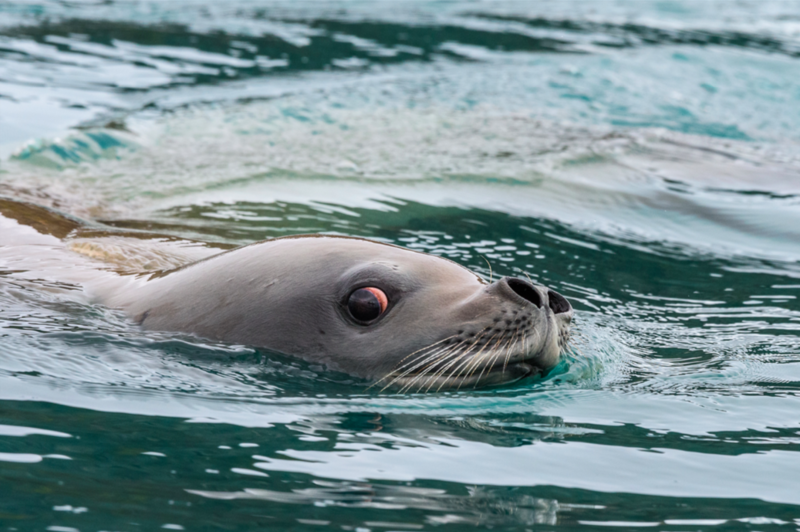 This shot of the seal was too good to miss and I have to acknowledge the photographer on board for this. There was cloud cover on most days which allowed for even light making photography a joy. There were a number of glaciers delivering their end load directly into the sea creating numerous crevasses as it flowed down the land. Oh! Many whales that Gail enthused over. Just fantastic. Passengers were given the opportunity to photograph and record the area under the tail fin which is unique to each whale. This is then sent to a website to assist with recording of type and travel movements of these animals around the world. Do you know how large krill are? About six cms and like a prawn. Phytoplankton. 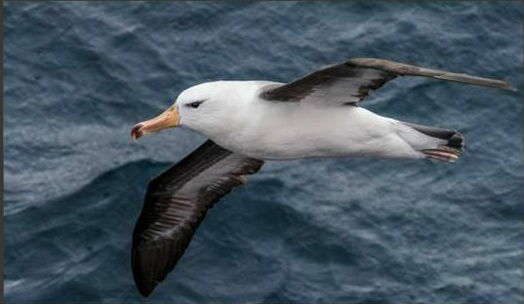 We come to the end with a few of the birds captured in flight being albatross and shags of many types. I just had to put this one in, dressing up for a black and white theme night with my interpretation of a penguin. 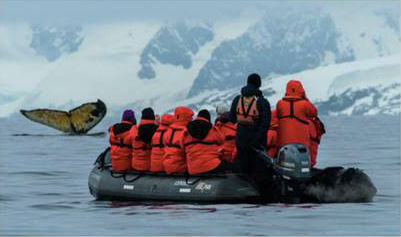 There were excellent lectures on the Antarctic Convergence, explanation of the many birds, seals, whales and penguins. Interpretation of what was seen each day and history lectures about the early explorers of Antarctica both before and after dinner were provided by the leader of the expedition and the many, very knowledgeable, mainly Canadian, on shore crew and Zodiac drivers. Almost the end of the excursion passing Cape Horn. President Paul thanked Croz on behalf of the club. Obviously members enjoyed Peter's talk as evidenced by the warm applause.